You are here: Home / Cocktails / Strawberry Vodka Slush – The Hottest Cocktail of The Summer! 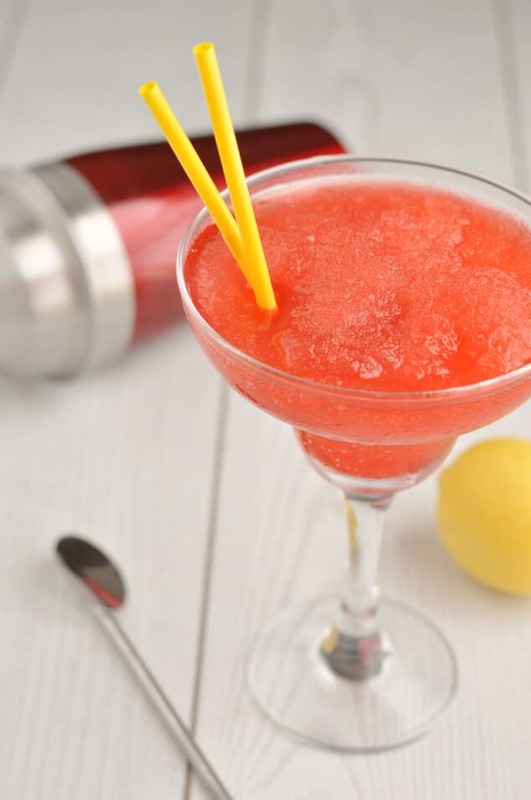 Strawberry Vodka Slush – The Hottest Cocktail of The Summer! Deliciously sweet and wonderfully refreshing, this strawberry vodka slush is the best way in the world to say TGIF! After a long, hard week at work (or at home if you’re a suffering stay-at-home parent!) you deserve something icy, yummy and alcoholic to cool you off and chill you out. Especially during the boiling hot summer months when the sky-high temperatures threaten to burst your thermometer. I get that you don’t want to spend forever in the kitchen to make yourself an icy cool cocktail. Which is why this strawberry vodka slush takes just minutes to make! Throw some ingredients into a pan and let them cook. Give them a bit of a mash then stir in the rest of the ingredients. Put it all in the freezer and wait for the magic to happen. Think you can handle that? Great! If you make a giant batch of this strawberry vodka slush (like I always do) you’ll have enough to last you the entire summer! Just 20 minutes of prep in exchange for a summer full of tasty, slushy goodness sounds like a pretty good deal, right? When you’re sitting in your garden (or balcony, or just leaning out the window!) with your eyes closed, sipping this summer drink, you’ll be transported to a tropical Caribbean beach, the soft sand between your toes and the gentle breeze blowing against your cheek and the sea laps on the shore. Okay, not quite. But you can pretend! If you make the strawberry vodka slush by following the recipe below, each glass will be around 100 calories. Which is pretty awesome for a cocktail as sweet and delicious as this! If you want to cut the calorie count down to just 65 calories per glass without sacrificing the taste or the alcohol, listen up. Replace the sugar with artificial sweetener. I can’t tell you how much sweetener you need to replace the sugar, because different sweeteners have different sweetness levels. One of the pill-type sweeteners I use is the equivalent to 1 teaspoon of sugar. There are 24 teaspoons in 1/2 cup, so that makes 24 individual sweeteners for this recipe. The strawberry flavour in this cocktail is really strong and totally masks the taste of most artificial sweeteners. This makes using a zero-calorie sweetener a great way to hugely cut down on calories. Use Sprite Zero, Diet 7Up or sparkling water. Another great way to lower the calorie count is to switch ordinary Sprite/7Up for the zero-calorie diet versions. They give you the same taste without the calories. Strawberries are really sweet anyway, especially when combined with sugar or artificial sweetener. So it’s worth giving sparkling water a try. But if you’re really into sweet cocktails, try one of the diet sodas instead. Avoid Stevia. Stevia’s got a very strong taste that overpowers the strawberries in this summer cocktail. So unless you love the taste of Stevia, use a mild-flavoured artificial sweetener instead. You don’t need any strange ingredients to make this slushy cocktail. But you will need a pretty large freezer-safe plastic container to store it in. Sure, you could make a fraction of the recipe and pour it into a small Tupperware box, but where’s the fun in that? You’d only have to make another batch the next day. Plastic containers get really brittle when you keep them in the freezer and snap easily. That’s why you need a strong and sturdy container that will stand up to the challenge. I use this 6 quart container. It’s large enough to fit all the cocktail inside and is really strong so it won’t break. If you’re going to double (or triple, or quadruple!) the recipe, you’ll need a 29-cup container. Containers this large and sturdy are super hard to find in stores, but you can easily pick one up online from Amazon. 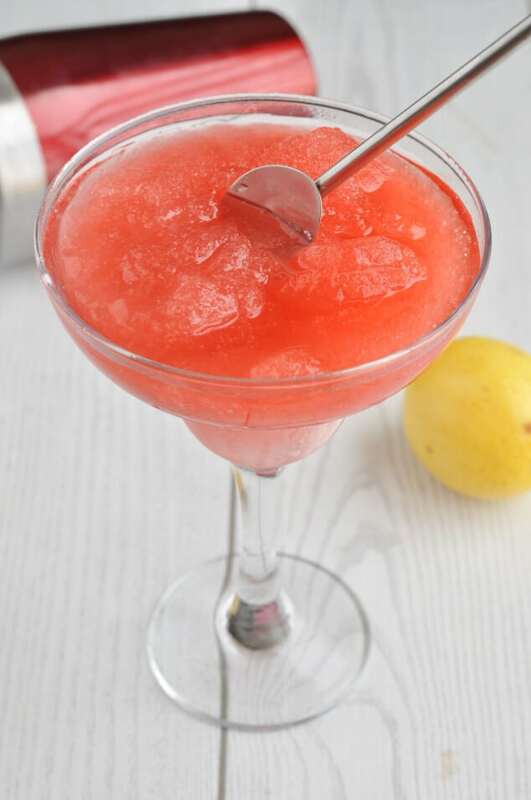 To scoop the strawberry vodka slush into glasses, you’ll also need a quality ice cream scoop. This cocktail can be quite hard when it freezes and you don’t want to end up bending all your spoons! 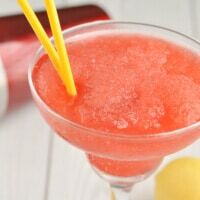 If you’re all about delicious frozen summer cocktails like this strawberry vodka slush, you need to check out my lemon vodka slush! It’s really similar to this recipe, but loaded with fruity tropical flavours. 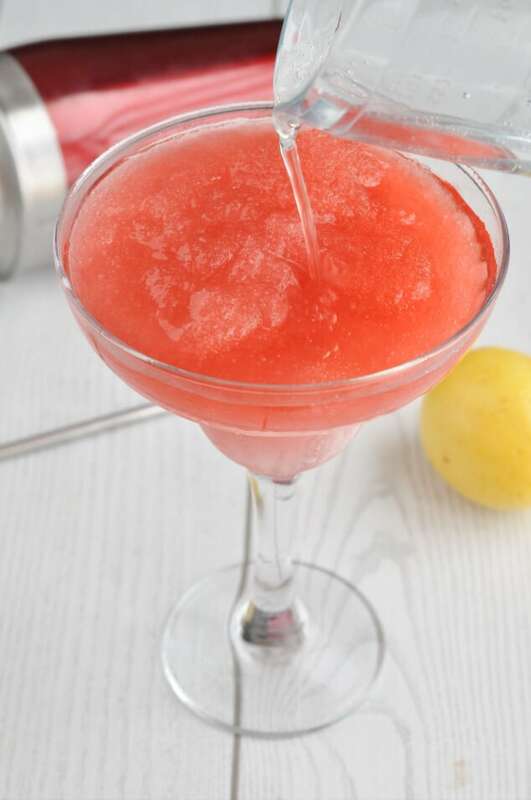 Oh, and while you’re at it, save this vodka cranberry slush in your bookmarks or on Pinterest, so you can enjoy festive slushy cocktails when Christmas comes around, too. 55% off my cocktail recipes book! Can’t get enough of yummy cocktail recipes like this one? Then you need my ebook – A Year of Cocktails: 52 Sensational Drinks for Sipping Throughout The Seasons! It’s on sale for $4.49. But if you sign up for my newsletter, I’ll send you an exclusive discount code for 55% off. That means you’ll get 52 fabulous cocktail recipes for just $2! Sweet, fruity and loaded with alcohol, this strawberry vodka slush is one of the best cocktails for a crowd you'll enjoy sipping all summer long! Place the water and sugar/sweetener into a saucepan over a high heat. Bring to a boil and add in the strawberries. Reduce the heat so the water is simmering and leave to cook for 15 minutes, until the strawberries are completely soft. Use a hand-held blender to totally break down the fruit. Remove the pan from the heat, pour into a large freezer-safe container and leave to cool to room temperature. When cooled, stir in the vodka, lemon juice and Sprite/7UP/sparkling water. Place in the freezer for at least 24 hours to set. To serve, use an ice cream scoop to fill a glass with the frozen slush. Top with extra Sprite/7UP/sparkling water until it reaches the rim, mix everything together so the drink is slushy and enjoy! 1 glass is 65 calories if you use zero-calorie artificial sweetener and zero-calorie Sprite/7Up/sparkling water. Haha! I only made a batch a few days ago, Erin, and it’s already ‘disappeared’ from the freezer! Looks delicious and refreshing! Glad I have a partner who also DIY’s. Having had the other I know how long a project can drag on…. BUT Yea! for new kitchen even if it takes a bit. Thanks so much Briana! This whole kitchen thing has been dragging on for about a month now. I feel like I’m missing summer! I’m so glad I brought you back some happy memories, Suzy! And I really hope my recipe lives up to your grandma’s standards! It makes 6-8 servings, Teri. Thinking of trying this. What do you think of using rhubarb, or watermelon? Hi Tom! I’ve only ever made this recipe with strawberries, so I can’t say for sure, but I don’t see why strawberries or rhubarb wouldn’t work! Rhubarb is a bit bitter, so you’ll probably have to add in some extra sugar to counteract the bitterness. Hello there, I’m dying to make the drink but I was wondering what or where to find the lemon-fizzy drink? this looks so refreshing and perfect for summer. I love the color as well. Thanks so much, Maria. It looks as good as it tastes! Thanks, Bintu. You’re exactly right! I would love to try this without the vodka!! Looks so refreshing! It totally works out the vodka, too, Felesha! This sounds incredible! I also love the photo on the beach, makes me wish I was on vacation! I’d love to try this in a non-alcoholic version! Sounds perfectly refreshing! And that photo is taking me to a wonderfully tropical place in my mind, and I could use a trip! What a perfect summer cocktail!! So perfect for on the beach or beside the pool! 30 strawberries is puzzling, I have some average size and some huge ones in my container from the store, is about 16 oz the right amount? 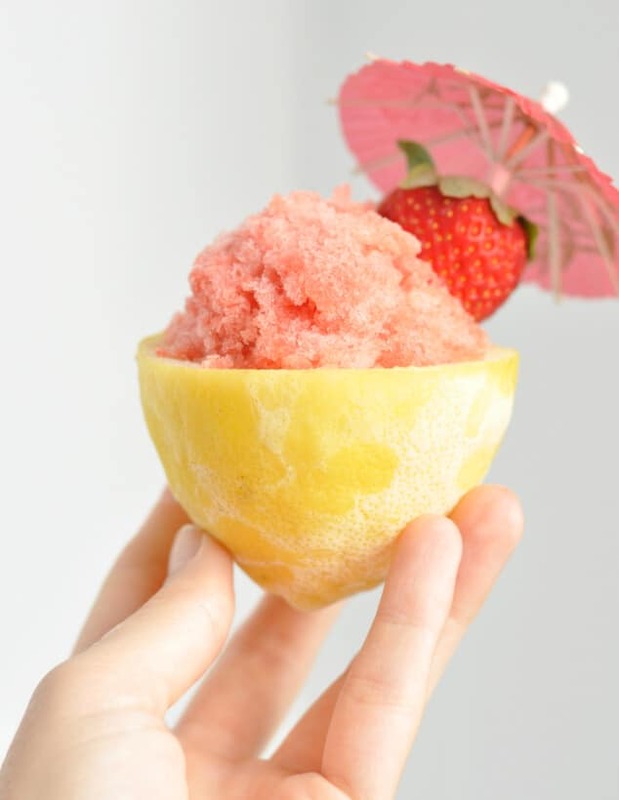 Could you use frozen strawberries?